Old Cardboard, LLC. was established in December, 2003, to help bring information about vintage baseball card collecting to the hobbyist. Produced by collectors for collectors, this comprehensive resource consists of three components: (1) Old Cardboard Magazine, (2) this companion website (www.oldcardboard.com) and (3) a free monthly eNewsletter. The Old Cardboard website contains more than 1000 pages of reference information about baseball card sets produced fifty years ago or longer. Each of these set summaries has a direct set-specific link to auctions and a similar link to 's powerful search engine for further research. The website also includes a Show and Auction Calendar, an eBay Top 50 Vintage Sellers List, and much more. As a result, the Old Cardboard website makes a great "Alt-tab" companion for vintage card shoppers and researchers. Old Cardboard eNews provides current hobby news, upcoming shows and auctions, and updates to the website and the magazine. It is published around the middle of each month. For a FREE subscription to the eNewsletter, or for subscription information on Old Cardboard Magazine, please visit the website at www.oldcardboard.com. If you find this information resource helpful, please tell your friends. We need your support and your feedback. Thank you. In a very real sense, the origins of this website extend back to the late 1980's. That's when Brett (before he got his drivers license) started collecting baseball cards and asked me to take him to card shows on weekends. Although I wasn't too interested in the newer cards that he collected back then, I started talking with some of the dealers of older (pre-1950) cards at the shows. I quickly got hooked. Perhaps there was not a more fitting time to begin such an endeavor. The baseball Hall of Fame in Cooperstown was then celebrating its 50th year since it opened in 1939. And even more relevant to the card collecting hobby, the first widely distributed baseball card sets were at that time aging just over 100 years. To bring some focus to the collection, I decided to collect a "type set," or a collection made up of samples from as many of the hundreds of different card sets as time and budget would allow. A key advantage in collecting such a type set is that it helps tell the history of baseball cards, and through them, of the sport of baseball itself and the companies that sponsored the cards. By following this theme and by researching the origins of the card sets, I was able to add some narrative to the collection and, hopefully, make the collection more interesting and informative. So that the scope of the collection and the website could be narrowed to an (almost) manageable size, the issue date of the sets covered is now for cards fifty years old or older. Thus, with a few very minor exceptions, the many thousands of sets added in the past fifty years are NOT included. With the advent of the internet, the format for the narrative was modified for use on a website. The generous support of other collectors and dealers has allowed for the continued expansion of set information and images, thereby increasing the overall number of sets that could be profiled. Many of these sets contain cards that I would otherwise not have the financial resources to acquire for my own collection. With the addition of these new images, the website now includes profiles for most of the important (and some not so important) sets issued throughout those early years of baseball card production. 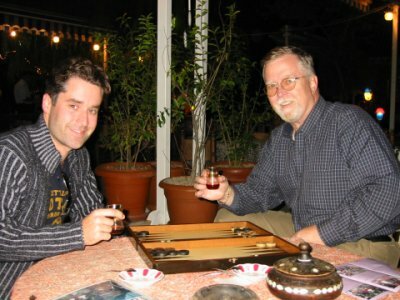 Brett and Lyman Hardeman, who together make up the entire staff at Old Cardboard, relax for some Turkish tea and a game of backgammon in Istanbul a few months before Old Cardboard was launched. Despite the endless diversity of items for sale at the city's world-famous Grand Bazaar, the father-son team discovered that there were no baseball cards to be found! Meanwhile, Brett graduated from college and, after spending about five years in marketing for Dell Computer, took a sabatical to travel and "see the world." Toward the end of Brett's extended "vacation," he took a renewed interest in card collecting and this baseball card website project. He has now joined me full time in getting the website launched and in planning new and related projects. To date, more than five hundred vintage baseball card sets have been profiled on the website. These set profiles include information such as the issuing company, card size, a summary description, American Card Catalog (ACC) number and links to live auctions. In addition, a representative value for each set is provided for a common player card in VG condition, and much more. We hope that you enjoy your visit to Old Cardboard and invite you to return often. Your feedback and ideas are always welcome. Send to editor@oldcardboard.com. Links to the Old Cardboard Website. We welcome URL pointers that link to our pages and encourage you to tell your friends about oldcardboard.com. Due to several requests, we have provided these images of our logo for those desiring to link to Old Cardboard by using an image icon. Feel free to download either image for use in your link as desired.